Mrs. Pota Vurnakes Vallas passed away peacefully at home on December 12, 2017 at the age of 109 surrounded by her loving family. She was a loving wife, mother, sister, and a pioneering entrepreneur and businesswoman. 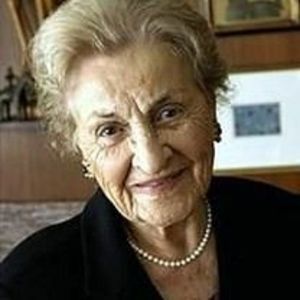 Mrs. Vallas was born in 1908 in Krissafa, Greece, a small village near Sparta, the eldest of 10 children, Panayiota "Pota." In 1924, Pota's father, who was Raleigh's first Greek immigrant, Gus Vurnakes, brought Pota to the United States where she assisted him at the California Fruit Store on Fayetteville Street. At only 16 years of age with no English proficiency, she made homemade ice cream and chocolates, which were delivered via horse-drawn wagon to leading homes and businesses. The remainder of Pota's family fled to Raleigh in 1939 only months before the Axis Occupation of Greece. In 1927, she married her husband and fellow immigrant, the late George Theodore Vallas before the onset of the Great Depression, which wrought devastation on the Vurnakes and Vallas families. They lost their home, life savings, and the California Fruit Store. It was in the midst of the Great Depression that Pota displayed her innate Greek resolve to succeed. She applied to work for the Singer Sewing Company in 1931 and quickly emerged as a talented salesperson and manager. During the Depression, Pota, George, and many other Greek families established a small Orthodox Church in downtown Raleigh. In due time, Pota and George purchased land and built a home on Leadmine Road. With Raleigh's Greek population growing rapidly, Pota and George donated land for the construction of the new Holy Trinity Greek Orthodox Church that still stands today on the corner of Leadmine Road and French Drive. Pota's dream of opening her own business became a reality when in 1944 she traveled to Chicago with husband George and acquired the distributorship of the National Sewing Machine Company. Her many buying trips to New York inspired her creative mind and talents, which blossomed into one of North Carolina's leading interior design firms. To accommodate the growing business, George purchased the three-story brick building for Pota at the corner of Hillsborough Street and Glenwood Avenue. National Art Interiors became a landmark for the finest furniture and fabric companies, furnishing many of the finest homes and businesses in North Carolina including First Citizens Banks and Capital Broadcasting Company. Pota worked at National Art Interiors with her daughters and other family members until she retired at the age of 94 in 2002. Pota served on the Boards of First Citizens Bank and the North Carolina Community Foundation. She was a life-long member of the Holy Trinity Greek Orthodox Church and a member of Philoptochos. She was honored with the Saint Michael's Award, the highest recognition for a layperson, for her years of dedicated service by the Greek Orthodox Diocese of America. Among Pota's many gifts, perhaps her most significant was her ability to make everyone she encountered feel special and was much loved by all. With indomitable spirit and her ever-present smile, she embodied the phrase "Where there is a will, there is a way." With great energy and faith, she said, "Yes to Life" that was the driving force for her lifelong success. Pota was preceded in death by her husband George and daughters Harriet Apostolou and Vicky Pediaditakis. She is survived by her children Roxanne (Steve) Serletis of Raleigh and Ted (Dot) Vallas of Fuquay-Varina; and grandchildren William Serletis, Johanna (Jim) Irving, George (Tracy) Serletis, Karen (Socrates) Gliarmis, Constance (Akim) Anastopoulo, Alex (Harriet) Apostolou, Stephanie Vallas, Paula (Angelo) Anastopoulo, Cara (John) Adcock, Stephanie (Jesse) Goslen, Nicole Pediaditakis, Peter (Beth) Pediaditakis, and 22 great-grandchildren. Visitation will be Friday, Dec. 15, 2017 from 6:00-8:00 p.m., with a Trisagion Prayer Service at 7:00 p.m., at Holy Trinity Greek Orthodox Church, 5000 Leadmine Rd., Raleigh, NC 27612. The funeral will be held Saturday, Dec. 16, 2017 at 11:00 a.m. at Holy Trinity Greek Orthodox Church followed by a graveside service at Montlawn Memorial Park. In lieu of flowers, the family requests donations be made to Holy Trinity Greek Orthodox Church, 5000 Leadmine Rd., Raleigh, NC 27612, www.holytrinityraleigh.org or Transitions LifeCare, 250 Hospice Cir., Raleigh, NC 27607.